It is finally here, only 6 more sleeps till we have meaningful baseball games. 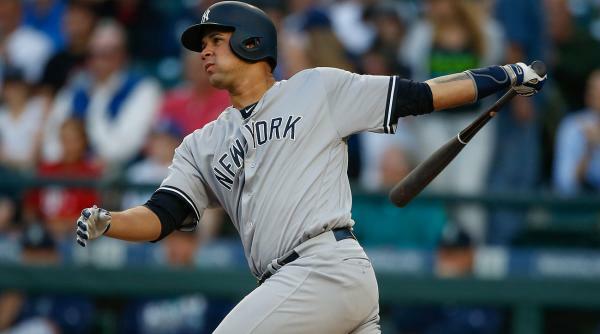 The Yankees will be the first team batting in the new Major League Baseball season, in this blog I will be previewing that Yankees’ starting lineup and realistic expectations for the Yankees’ offense. The Yankees’ batting lineup was not expected to change much from last year except for a change at first base. Greg Bird was expected to replace the now retired Mark Teixeira, but things have not been going smooth in Yankeeland with the injury to Didi Gregorius in the WBC. Below is the lineup that is going to playing in the first game at the Trop in St. Petersburg, next Sunday afternoon, also there is a projected lineup once Didi returns to the Bronx. There have been plenty of trade rumors surrounding Brett Gardner, who is now the longest tenured Yankee on the roster. Realistic expectations for Gardner are having about .310 average and about 30 steals. If the Yankees struggle out of the gate, then there will be an increase in the trade rumors surrounding Brett Gardner. Gardy still is a very good defender despite not having a great offensive output last season, he can be a great contributor on a contending team. There is a realistic chance that Gardy is not on the roster on August 1 after the trade deadline, but until he is still dawning the pinstripes, he is going to be a very good table setter for the heart of the Yankees’ lineup. Unlike Gardy there have not been any trade rumors surrounding Ellsbury unfortunately for the Yankees. Ellsbury’s contract might be considered one of the worsts in baseball history, as the Yankees were desperate for a free agent splash at the time of his signing. Ellsy’s tenure with the Yankees has been very rocky and he was benched for the only playoff game in his tenure. The Yankees would sell their soul to the devil if in return the Ellsbury contract would come off their books, but that is not realistic. Ellsy is not going anywhere in 2017, and him hitting .300 with 70 RBIs and 25 steals will be considered a great season for him. He might be the leadoff hitter if and when Gardy gets traded, he needs to be a consistent table setter if the Yankees want to play games in the middle of October. Starlin Castro had a great first year in the Bronx, there have not been many signs that show that his progression is going to be halted. Castro is a very important hitter for the Yankees’ success, but he can be moved around in the infield based on injuries and call ups. Gleyber Torres and Jorge Mateo have shown potentials to be future stars in the MLB, and they both can play the position currently occupied by Castro. Look for Castro to use that pressure to his advantage and have a solid season. If Castro is a 20 home run hitter and brings in the table setters from the top of the lineup, it will take the pressure of Gary Sanchez, which will allow Gary to play more freely. Castro is still very young and there is a chance he is going to play shortstop while Didi is away before moving back to second base. Castro has a chance to be an All-Star if he uses the dimensions of Yankee Stadium to his advantage. Matt Holliday was signed by the Yankees to act as a mentor to the Baby Bombers and contribute offensively. He is not going to be fielding a lot, unless if there are a lot of injuries, he is only here for his bat. Holliday can still contribute with the short dimensions of Yankee Stadium, but his role is more off the field, helping the young hitters being one of the more experienced veterans on the team. He is going to be a free agent at the end of the season, he most likely wants to play beyond this season, so he is going to put his best effort forward this season. If Holliday struggles, the Yankees can replace him with Chris Carter, who led the National League in home runs last year. Holliday does not need to have a good season for Yankees’ success but it would be a huge positive if he bats to the back of his baseball card. Greg Bird, who missed all of last season with injury, has been on fire this spring training. There were no expectations for Birdy coming into spring training, but as the Yankees get ready to head north to the Bronx, those expectations have changed. Bird is going to play almost every game even if he struggles, Bird will have a decent year for his first full season in the pinstripes. If Bird struggles miserably or his injury pops up again, the Yankees have quality players backing him up at first base, in Chris Carter and Tyler Austin when he recovers from his injury. I do not expect Bird to be benched this year and he will not embarrass himself, his performance can definitely play a role in the Yankees overall success. Headley really struggled out of the gates last season, but recovered enough to put up a decent season. He can not repeat his struggles this season if the Yankees want to play in the postseason. Headley, like Gardy is a possible candidate to be traded to a contending team. Headley can still be a very good bench player, if he has a very good early season, the Yankees might trade him and acquire more assets. The Yankees do not really have a player that is major league ready to play at third base, Tyler Wade is the closest to being ready but his focus is going to be on the middle infield before going elsewhere. Headley will have to contribute to this team or he might be traded again. If you had told me at this time last year, that Aaron Judge will be batting eighth and possibly batting ninth after Didi’s return, I would not have believed you. Judge came up to the majors in the second half of last season and had a great first game before leveling off. Judge has potential to be a 30+ home run hitter or have a strike out rate in the high 70s. If Judge can turn some of his strikeouts into possible balls in play, he can definitely move up in the lineup. If everything goes well, Judge might be a 25 home run hitter this year, but there is a very good chance that he bats below a .200 average and really struggles. Judge was once considered a cornerstone in the Yankees’ plan for the future, but with the addition of Clint Frazier and Judge’s struggles in the majors, he needs to have a really good season to remain a part of the Yankees’ future. Ronald Torreyes is just acting as a placeholder until Didi returns from his injury. Toe did not have a bad year last season as an utility player. If he does not embarrass himself while playing in Didi’s spot, the Yankees will be content. Any offensive output coming off Toe’s bat will be a bonus for the Yanks and their pursuit of adding a possible 28th World Series. We simply have no idea when Didi will return to the Yankees, so his expectations will have to be reconsidered when he is fully healthy. Didi had the potential to be an All-Star this year if he was healthy. His tenure in the Bronx has been great and the trade that landed him to the Bronx, might be one of the best in GM Brian Cashman’s career. If and when Didi returns, he will need to have a really good year if the Yankees want to even sniff a possible postseason spot. Didi is among the Top 5 most important players on the roster who will dictate their success. The Yankees are not a traditional “World Series or bust” team this year, instead this year is going to dictate how quickly they become a championship contender again. If all the Baby Bombers play really well even if it does not translate into wins, this year will be considered a success. I will talk about where I think they end up in the standing in a blog dropping Wednesday, but if they are playing meaningful games in the second half of September than they will have exceeded my expectations.